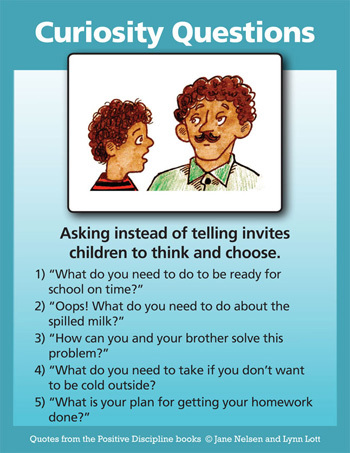 Helping children explore the consequences of their choices is much different from imposing consequences on them. Exploring invites the participation of children to think for themselves and figure things out for themselves, and to decide what is important to them, and to decide what they want. The end result is focusing on solutions to the problem instead of focusing on consequences. Imposing consequences often invites rebellion and defensive thinking instead of explorative thinking. The key to helping children explore is to stop telling and to start asking curiosity questions. Too often adults tell children what happened, what caused it to happen, how the child should feel about it, what the child should learn from it, and what the child should do about it. It is much more respectful and encouraging when we ask what happened, what the child thinks caused it, how the child feels about it, what the child has learned, what ideas the child has to solve the problem, or how the child can use what she has learned in the future. This is the true meaning of education, which comes from the Latin word educare’, which means to draw forth. Too often adults try to stuff in instead of draw forth, and then wonder why children don’t learn. Watch this video for examples of Asking vs Telling. How can you use what you learned in the future? What ideas do you have for solutions now? I call these typical curiosity questions because it is important not to have a script. The point is to get into the child’s world. You’ll notice that "Why?" isn’t one of the suggested questions. The reason is that "Why?" usually sounds accusatory and invites defensiveness. This isn’t always the case. All of the questions can be asked in an accusatory tone of voice. "Why?" works when children feel that you are truly interested in their point of view. Don’t have an agenda. You aren’t getting into the child’s world if you have an agenda about how the child should answer these questions. That is why they are called curiosity questions. Don’t ask questions if either of you are upset. Wait until you are both feeling calm. Ask curiosity questions from your heart. Use your wisdom to show you how to get into the child’s world and show empathy and acceptance. When the solutions come from the children, or are brainstormed together and the child chooses what will be most helpful, they learn that they can make a valuable contribution when using respectful decision-making skills. Children learn that mistakes aren’t horrible if you don’t beat yourself up about them and if you look at mistakes as opportunities to learn. What do you do when your child consistently answers "I don't know", or "Nothing". ? This is where your method breaks down for us. It is important to use your own intuition as a parent when applying any of the Positive Discipline Tools. "I don't know" is a very common response from children. There are many options for parents. If an immediate response is not required, you could say "Think about it and come get me when you have some ideas." Or you can check some things out with the child. Ask them what you think might be going on and then check it out. "Does that sound right?" Or relate a story from your childhood. "When I was your age, I had a similar situation and this is how I felt and how I solved the problem." Also remember that the feeling behind what you do is more important than what you do. If you are asking Curiosity Questions with anger or in an accusatory tone, it is very common for children to shut down and say "I don't know." When a child says 'I don't know' or 'nothing' it can be because they are fearful of a parents reaction to what they might say. A useful strategy is to offer 'imagine if you did know' or 'imagine if there was something' ... what would that be? Then If they still can' t say anything, you can make a game out of it, and maybe ask their shoulders if they know, or their feet, or their tummy. You can make up a serious or funny response by playing the role of the body parts ie 'well since I'm a shoulder, I guess I could x'. Soon there will be lots of laughter and fun between you, and the fear of answering the questions correctly will have melted away, and you'll suddenly get a 'wait, I do know' or an 'I have something to say'. You can take the game a little further and say 'but your knee hasn't said anything yet' ... and they will be so bursting to tell you what they have to say, that you can tell the knee that you really want to hear your child's answer first! This is just one idea. I hope that it helps.